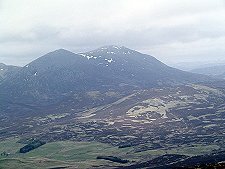 Ben Vrackie, or "Speckled Mountain" lies due north of Pitlochry and can be seen in many views from the town or from Blair Atholl to the north west. 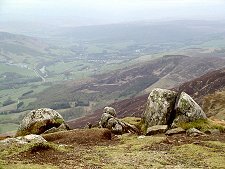 At 2,759ft in height, Ben Vrackie is a Corbett, a separate hill of between 2,500ft and 2,999ft in height, with a drop of at least 500ft all round. But you don't have to know that to enjoy it. Ben Vrackie is sometimes climbed from Killiecrankie, to the west. The starting point we describe here is the more popular approach. To find it you head uphill from Pitlochry on the Braemar road for a mile or so until you find the large white Moulin Inn (an excellent pub, by the way, complete with its own brewery). Turn left behind the inn and follow your nose and the small but obvious signs to "Ben-y-Vrackie" uphill to a small car park. 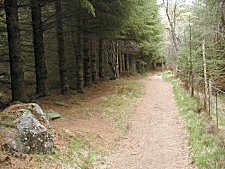 From the car park you follow the wonderfully constructed sandy and/or pine needle strewn path running steadily uphill through mixed deciduous and conifer woods for about a kilometer, crossing a couple of streams on well constructed wooden bridges. A really lovely walk in its own right, this eventually leads you out onto open hillside and your first views of Ben Vrackie, beyond the ridge ahead. 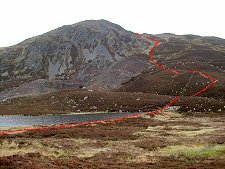 The path stays in excellent condition and leads you steadily upwards to the ridge between Creag Bhreac to your right and Stac an Fheidh, slightly to your left. Part of the way up you are presented with a signposted junction, leading left to the "bealach path" or, right, the route you want, to Ben Vrackie. Once over the ridge, the path continues to the low dam at the head of Loch a'Choire, which it crosses. Some guide books recommend this route in preference to a path cutting straight across the shallow valley below the dam. This has now been closed for reseeding, so the older - in any case boggy and best avoided - option is no longer available. So far you've had it easy, climbing from the car park at around 200m to the dam at about 520m in some 3.5km. This is half the total height you've got to climb. 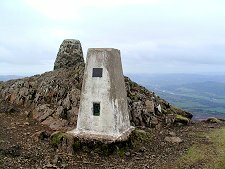 The rest now lies directly between you and the summit at 841m, but you climb it over a distance of 1km. Simple arithmetic shows that what's to come is very much steeper than anything you've seen so far: but who needs arithmetic to work out what's obvious from simply looking at the rest of the climb, now looming above you. While there's no evading the steepness of the pull up to the summit of Ben Vrackie from the dam, much of it is over superbly made paths barely visible from the valley below. Opinions differ widely about the pros and cons of made paths. 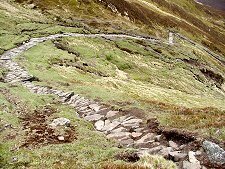 But on a very popular mountain like this, there's no doubt that the impact of so many boots is reduced dramatically by the presence of works of art like these: some of the best made and most easy to use stone paths we've seen on any mountain anywhere. There still remain a few stretches where you have to find your own way, and the erosion here proves beyond doubt the benefits of the made paths elsewhere. But this is certainly one of the easiest climbs of a mountain of this height you'll find, and the path leads you to within a few yards of the summit. Ben Vrackie's summit offers, on a good day, one of the best viewpoints in the southern highlands. North lies the mass of Beinn a'Ghlo with Glen Tilt and the vast wilderness of the Cairngorms beyond. As well as the usual trig point on the summit, you will find a viewpoint indicator, naming what you can see and resolving all those arguments about whether you can or can't see Lochnagar (you can), and what that funny shaped one with all the snow still on it is. Ben Vrackie isn't one of Scotland's most challenging mountains. 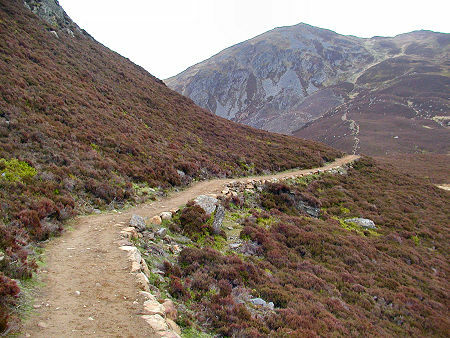 Indeed, the height, the gradient, and, in particular, the quality of the paths mean you can climb it in most weathers without getting your boots muddy. It is a busy mountain and is not to everyone's taste, but remember that you can have even the busiest of mountains to yourself if you pick your time right. It is well worth climbing in its own right: or to allow the real anoraks amongst us to stick another Corbett-coloured pin in the mountain map of Scotland. Ben Vrackie is 841m or 2,759ft in height. 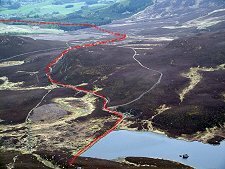 The route described here is about 9km or just over 5 miles in length. It involves some 700m of ascent. The route can be seen in red on the photos below.